Credit: Molly Rowan Leach/Feverpitched. All Rights Reserved. It’s a warm summer night in Longmont, Colorado, a vibrant midsized city in the Rocky Mountains. On a dare, six young men aged between ten and thirteen years plan to break into a giant chemical processing plant. High levels of alcohol and testosterone, peer pressure and a moonless night propel the group towards the locked gates of the factory, and they break in. Across town at the Police Department, Officer Greg Ruprecht is about to embark on night patrol. A former Army Captain and top of his class at the Police Academy, Ruprecht believes his job is to arrest everyone who commits a crime and throw away the key. Justice means punishment: an eye for an eye, no questions asked. You do something bad and you get what you deserve. There’s a clear line to walk. But what occurred at the chemical plant that night changed him forever by awakening a very different sensibility: instead of an instrument of vengeance, justice requires that we work to restore all those who have been injured by a crime. The police transponder went off not long after he arrived in the industrial area of the town. “Six suspects breaking and entering at BioChem Industries, 644 Southwest Way, over.” “Roger, patrol 33 in vicinity and responding” he replied. As with any emergency, in the time between receiving the call and arriving at the scene, Ruprecht imagined what was happening, and tried to prepare himself mentally to avoid underestimating any of the circumstances. It was known in town that the plant had highly toxic chemicals inside, and he assumed he’d be dealing with seasoned thieves who would be armed. Carefully emerging from his car, the scene was quiet except for the tall grasses in the field to the left of the plant that provided a possible route of escape. Given the moonless night he had to switch on his searchlight to back up his suspicion that the suspects might be hiding in the grass. He carefully pulled his gun, just in case. Bingo. The spotlight beam illuminated the bobbing heads that were running for their lives. But these were not the heads of adults. Kids, he thought - these are just kids. He called out for them to halt. Almost out of earshot but just enough to look back, two stopped, while the rest stumbled on, hesitated, and then realized the seriousness of what was happening. Once he was next to the group, Ruprecht found he was dealing with six boys. It shocked him. Not only had these kids committed a felony with their break-in, but they had endangered their own lives and the lives of others because of the chemicals that were housed in the plant. He took them to the police station and kept them there, ready for processing into the US criminal justice system. This is a system with a national recidivism rate of between sixty and seventy per cent, dominated by a growing, for-profit prison industry with giant companies like the GEO Group and Correctional Corporations of America that rake in billions of dollars a year. It’s an industry that is built on incarceration and punishment instead of rehabilitation, with one in every ten young black males in the USA currently in prison. People with mental illness are thrown away, into a system that is glaringly unfit to treat and care for them. Children are subject to zero-tolerance policies and get wrapped up in the lethal web of the US prison-industrial complex. Corporate interests push for even higher rates of incarceration because their bottom line improves with every prison bed they fill. These are dark times for justice in America, and they offend the moral core of many US citizens. Still, what difference would six boys make? Six more to process; six more lives to waste. Except that this is not what happened. As Ruprecht was about to leave his shift the day after the arrests, his phone rang and the call almost knocked him off his chair. The case he’d handled the previous night was being re-directed, into a process that’s called “restorative justice” - an easy way out for offenders in his mind, some sort of hippie gathering where everyone would hug. Later that week the process got started. Ruprecht and the boys joined a small group of professionals from the Longmont Community Justice Partnership. Along with representatives from the boys’ families and from the chemical plant, they talked about what had happened and how to make things right. They discussed accountability, and how nothing would stay permanently on their records if the boys kept their word, so crucially, they would not become permanently considered as ‘high risk’ in the criminal justice system. Separate meetings between all the members of the group prepared them for a larger “circle process” that got everyone involved. The boys each got an opportunity to sit with the consequences of their choices, to discuss the ways they would do things differently in the future, and to share anything from their home or personal lives that might have influenced their decision to break into the plant that night. Held in a safe environment that did not undercut the importance of accountability, each boy heard the plant representatives speak, and began to understand that their acts had real consequences. Apologies were made. The restorative justice process gave the boys one clear message: their actions were the problem, not themselves as human beings. They rolled up their sleeves and took part in creating their own contracts for restitution in the form of one hundred hours of sweat equity in the same plant the group broke into, plus alcohol awareness classes and an agreement to write a story about what they’d learned for the local newspaper. Then they signed the contracts and got to work. Officer Ruprecht continued to feel skeptical about this process, but something was definitely changing. He saw how much money had already been saved by choosing to go down this route instead of jailing the boys and sending them into a lengthy and expensive judicial process. 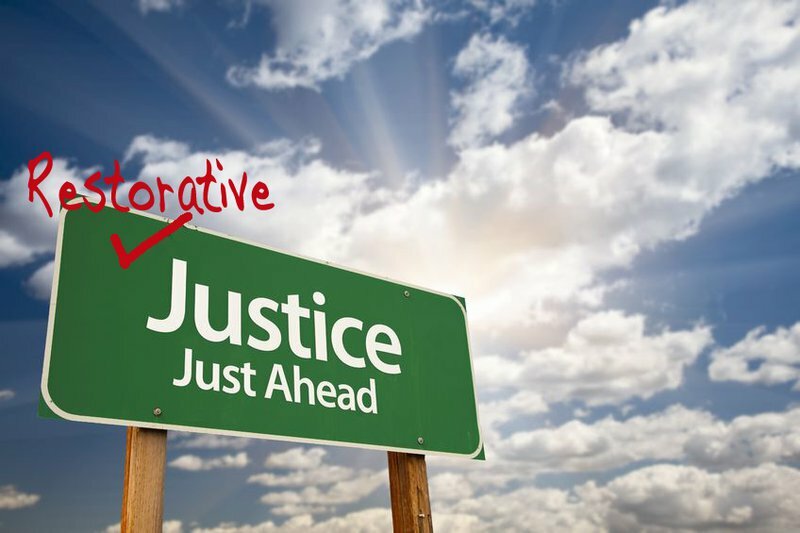 He realized that restorative justice had more teeth than conventional punishment because it imposes real, face-to-face accountability among offenders for their actions, and makes them listen directly to the victims of their crimes. He realized that six young lives might be saved from years of cycling in and out of the prison system. He learned that the human brain doesn’t develop fully until the age of twenty-two or thereabouts, so punishment and fear-inciting prison regimes have an even bigger impact on the development of young people. He remembered his own children, and recognized that more than anything else, they and others deserve the chance to make mistakes and pick themselves back up again, sure in the knowledge of their own inherent worth and value. So he decided to stay engaged in the process. He took on other cases and found that the usual suspects weren’t recycling through the police department any more. Recidivism dropped to ten per cent, and surveys showed high rates of satisfaction with the process among everyone involved. In fact Ruprecht is now a Police Ambassador for Restorative Justice, one of the first of a growing number of law enforcement officials and corrections officers in the USA who believe in, and are enacting, the systemic changes that are saving lives and not just Dollars in the American justice sector. The role of justice, as portrayed by Lady Justice’s scales, is to bring back balance, to make things right again. Punishment and the warehousing of human beings in prisons destroys vast amounts of human potential. By contrast, restorative justice meets the needs of everyone involved in the most humane ways possible – those who commit crimes, and those who suffer from them. In so doing, it brings humanity back into the justice system. It converts a limited worldview based around isolation and individualism into a much more positive vision that is rooted in honesty, accountability, and the visible connection of causes with effects. And it works in concrete terms by cutting recidivism and costs. Most important of all, it nurtures new relationships and a strong sense of human unity. In this sense, the root power of restorative justice is love expressed in action.